Someone finally noticed that the Scarlett Knight has white face and blue eyes, big deal! The idea of making multiple versions of the Knight is not only way too politically correct, but it would require so many versions that it would be very expensive and hard to give equal time to each version. My response to his ideas is completely negative. 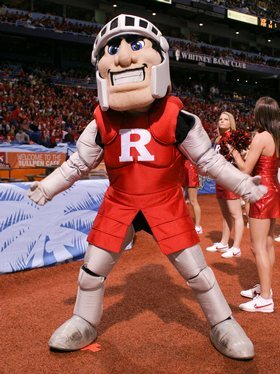 Firstly the Scarlett Knight is not about representing the diverse population of Rutgers; it is just a mascot not a representative of the university’s student body. Secondly there would have to be three versions for each race; male, female and transgender. It would quickly become cumbersome to maintain and keep track of who should be on the field next. And lastly, if Mr. Brennan feels so strongly about this why does he think that student fees should not be used to be for this change? It should not fall to the grossly overtaxed citizens of New Jersey to pay for a politically correct school mascot! Maybe he himself and the rest of RUSA plus any of his politically correct friends should do the paying. If it is so important that the mascot not have a white face and blue eyes I propose the following; the helmet should cover the whole face so no one would be able to tell what race the mascot is. Either that or make the face purple in color, after all that seems to be a politically correct color representing all of us. As a graduate of Rutgers University it is a sad thing to see such stupid ideas given any credence.